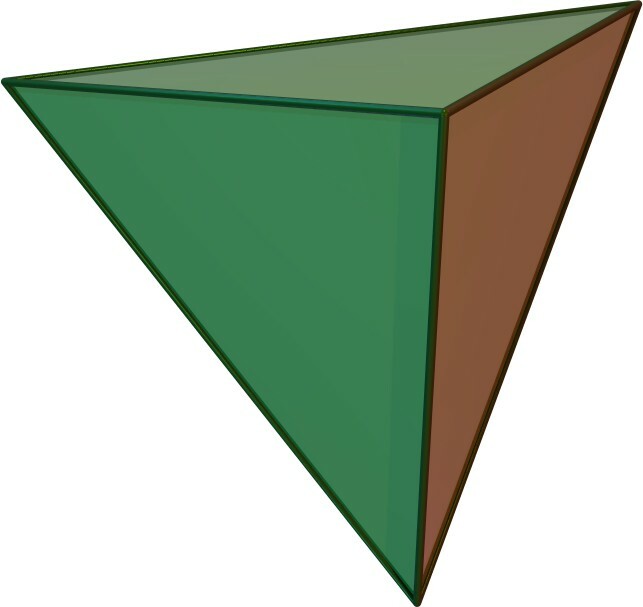 The truncated tetrahedron with hexagons replaced by triangles is not a convex deltahedron because it is not strictly convex. A deltahedron (plural deltahedra) is a polyhedron whose faces are all equilateral triangles. The name is taken from the Greek majuscule delta (Δ), which has the shape of an equilateral triangle. There are infinitely many deltahedra, but of these only eight are convex, having 4, 6, 8, 10, 12, 14, 16 and 20 faces. The number of faces, edges, and vertices is listed below for each of the eight convex deltahedra. The deltahedra should not be confused with the deltohedra (spelled with an "o"), polyhedra whose faces are geometric kites. In the 6-faced deltahedron, some vertices have degree 3 and some degree 4. In the 10-, 12-, 14-, and 16-faced deltahedra, some vertices have degree 4 and some degree 5. These five irregular deltahedra belong to the class of Johnson solids: convex polyhedra with regular polygons for faces. Deltahedra retain their shape, even if the edges are free to rotate around their vertices so that the angles between edges are fluid. Not all polyhedra have this property: for example, if you relax some of the angles of a cube, the cube can be deformed into a non-right square prism. There are an infinite number of nonconvex forms. Great icosahedron - a Kepler-Poinsot solid. H. Martyn Cundy and A. Rollett Deltahedra. §3.11 in Mathematical Models, 3rd ed. Stradbroke, England: Tarquin Pub., pp. 142–144, 1989. M. Gardner Fractal Music, Hypercards, and More: Mathematical Recreations, Scientific American Magazine. New York: W. H. Freeman, pp. 40, 53, and 58-60, 1992.